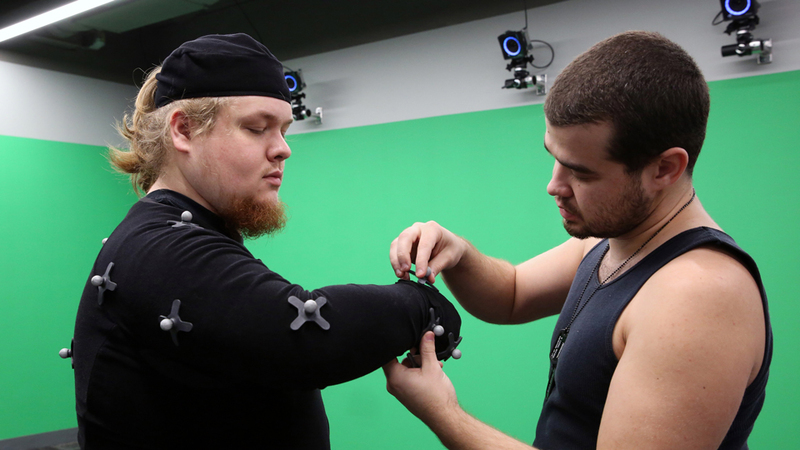 The Motion Capture Studio at Johnson County Community College allows students in game development and animation to take their skills to the next level. “This is the way the industry is going, so we’re trying to provide students the equipment and experiences they’ll need to enter the profession,” said Russ Hanna, Professor of Game Development. The 548 square-foot room is located in the Collaboration Center (CoLab), on the first floor of the Office and Classroom Building (OCB 110). About 8 feet above the floor are 16 cameras, spaced in intervals on all four walls. Each camera sends out infrared light. When the light hits the “marker” on a specially created suit, a signal is relayed to the computer. The computer then interprets this data and projects the coordinates of the markers onto its screen. The result is a bunch of moving dots connected by lines to resemble a moving stick figure. It’s the “skeleton” for a number of animation moves, such as running, jumping, dancing and fighting. Students get into skintight black suits with 41 markers from forehead to feet. Then they act out the movements they’ll need for their projects. Two walls are painted green for green-screen special effects, expanding the studio’s capacity for general video recording use as well. Christy McWard, Director of the CoLab, helps to promote awareness of this advanced technology. The CoLab often shares social media links that demonstrate growing impact of motion capture. When the film “War for the Planet of the Apes” was released in July 2017, the CoLab tweeted a video clip about actor Andy Serkis, perhaps the best known mo-cap actor, who offered a behind-the-scenes look at Hollywood’s use of motion capture technology. JCCC’s own Motion Capture Studio works on the same concept. Jared Smetkowski, game development student, said he really enjoys working with mo-cap. “I like that it gives me the chance to make the animations we really want. Using mo-cap, we can make realistic animations ourselves. And in a competitive gaming industry, every little bit of knowledge you gain is important,” he said. McWard thinks the studio will have many more practical applications in the future. Students studying in healthcare could use mo-cap to learn how the body works, for example. Hanna agrees there’s many possibilities and sees this technology leading to augmented reality. Interested in studying game development at JCCC? Contact Hanna at 913-469-8500, ext. 4167. If you’d like to talk to someone about JCCC’s animation program, contact Jim Lane, Dean of Arts, Humanities and Social Sciences, at 913-469-8500, ext. 3703. If you’re a community member who’d like a demonstration of the Motion Capture Studio for your group, contact McWard at 913-469-8500, ext. 4684.